Arizona rental contracts, for commercial and residential use, are written for the binding arrangement between a landlord and tenant for the use of real property. All agreements must be in accordance with the Arizona Residential Landlord and Tenant Act. All documents become legally binding upon all parties signing the form and acceptance being relayed to the other party unless both parties sign in the presence of one another. Rental Application – All potential tenants should undergo a background review by the lessor to make sure the employment and financial claims made by the applicant are accurate and true. Commercial Lease Agreement – For any property that an entity or individual may use as a place of business. Lease with Option to Purchase Agreement – Tenant pays rent like a typical lease with the added option of having the legal right to buy the property. Month to Month Lease Agreement (§  33-1375) – Known as a “tenancy at will” as both parties continue the landlord-tenant arrangement until one side decides to terminate or change the contract. Either party may terminate with at least thirty (30) days’ notice from the next payment date. Room Rental (Roommate) Agreement – For the use of renting a room or a portion of a residential unit. Standard Lease Agreement – The most widely used form as it is a fixed term arrangement that usually consists of twelve (12) months. Sublease Agreement – To re-rent a property under the control of a tenant. 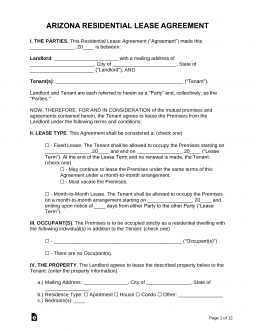 Termination Lease Letter – Used to cancel a lease arrangement. Tenant must check first to verify they are legally able to get out of the rental agreement. Bed Bugs (§ 33-1319) – Landlords are required to give “educational materials” to tenants about how to deal with bedbugs and how they spread. Fees (§ 33-1321) – Any fee stated in the agreement that is non-refundable must specifically state that it is non-refundable or else the amount is refundable. Landlord-Tenant Act (§ 33-1322) – The landlord must give the tenant a copy of the Arizona Residential Landlord and Tenant Act (Title 34, Chapter 3) at the time of lease authorization. Lead-Based Paint – Federal law requiring all landlords/managers/agents to inform a new tenant that a property may have lead based paint if built prior to 1978. Move-in Checklist (§ 33-1321) – All leases are required to have the move-in checklist attached. Whether it is completed by the Tenant is up to them. At the end of the lease the Landlord will be able to perform the move-out inspection by first giving the Tenant written notice of the move-out date. Notice (§ 33-1322) – Landlord must disclose the person(s) managing the property and give contact information for any legal notices. Shared Utility Charges (§ 33-1314.01) – If the landlord bills the tenant based on a shared meter the computation for how it is charged must be in the rental contract. The landlord may reimburse themselves for any administrative costs for calculating and paying the utility. Taxes (§ 33-1314) – If the business pass-through tax changes in the area of the residence the landlord may reflect the tax with at least thirty (30) days’ notice to the tenant. This option to increase the rent due to the business pass-through tax must be stated in the lease for it to come into effect. According to Section § 33-1343, the Landlord must give at least forty-eight (48) hours notice to tenant before entering the property for non-emergency inspections or maintenance. Maximum Amount (§ 33-1321) – Landlord may not ask for the tenant to put up more than one and a half (1.5) months’ rent. Returning (§ 33-1321) – Must be returned to the tenant within fourteen (14) days (excluding weekends and holidays) from the time of the move-out inspection.